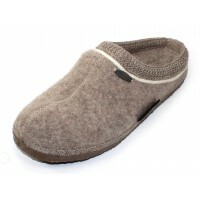 An indoor and outdoor lodge shoe made from 100% breathable boiled wool. Natural rubber outsole. Natural carbon and recycled rubber footbed. Anatomically correct, removable leather lined footbed. Wide toe box. Mud and dirt resistant outsole. Dirt repellant natural wool is temperature regulating in all season. Imported. Forget everything you think you know about wool, because once you step into a pair of Giessweins, you’ll realize that all wool is not created equal. Giesswein’s boiled wool is soft, lightweight, and breathable, helping to naturally regulate your body temperature in cold weather and warm weather. Wool fibers themselves are hollow—allowing sheep to “wear” their wool in all seasons—and therefore dry very quickly. In fact, wool can absorb up to 35% of its dry weight before it begins to feel wet against your skin, so even after a full day of active wear, your feet will still feel energized and dry. Giesswein wool is not your average boiled wool, and should never be mistaken for felt. It is lighter, softer, and more flexible than felt, and because of the intricate fulling process, it is completely machine-washable. Our boiled wool is a renewable, sustainable, odor-resistant, itch-free material that helps to keep your feet cool in the heat and snug in the cold.